For over 25 years, Jeanne White's guidance, expertise, insightfulness and expert negotiating skills have proved invaluable to her many friends and clients. She is known for superior real estate market knowledge, caring quality service and professionalism. Whether you are a first time buyer or listing a landmark property let Jeanne put her experience to work for you. 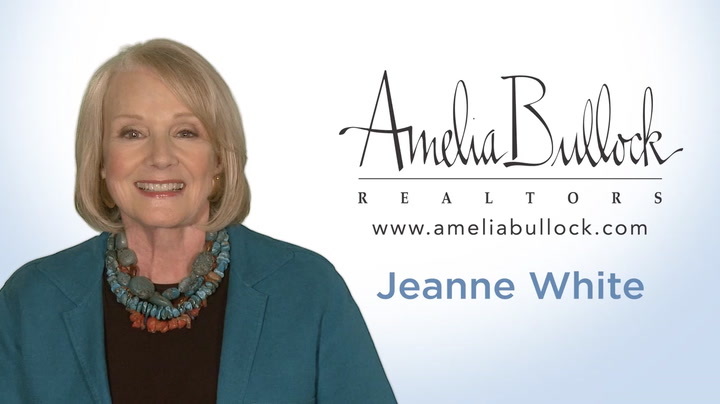 I'm Jeanne White with Amelia Bullock Realtors here in Austin, Texas. Every transaction seems like it has a cast of 1,000 people agencies, title companies, lenders, lenders assistants and I have a knack for bringing all of these people together and getting them really the best out of each and every one of them to make the transaction just as pleasant as it possibly can be. I just love putting families in the right neighborhoods, in the right schools and in exactly the right size house. It gives me so much pleasure to do that. I love thinking about them playing in their little yards, walking to the parks, boating on the lake and that is everyone from a tiny house to a huge house. It just gives me enormous pleasure to do that. I've been in this business now for over 25 years and watched Austin grow, watched the market go up and down and it does give me no question about it a great qualification for helping people and understanding what is today may not be two weeks from now and certainly isn't what it was six months ago and I do think that kind of experience helps me not be surprised by anything that might even come up in any one of these transactions. Part of my philosophy is having a win/win situation at the end of any transaction. Coming out of the title company with people feeling like they had some wins is very, very important to me. I've always loved real estate. I like the real aspect of it something that you can touch and I started out kind of remodeling a bit with small children at home and first a bathroom and then kitchen and loved the creativity of that and the investment, certainly the investment potential as well. Then my mother was in the real estate business with Amelia Bullock Realtors and we started working together and it's just been a delightful experience. I like selling all over town Dripping Springs to Georgetown, small and large, everything. Just taking care of my clients and then my client's parents and then my client's children and then my clients nieces and nephews. It's just a great opportunity to work with people and have a nice time. If I can help you with any of your real estate needs, give me a call or shoot me an e-mail and I will be so happy to help you.